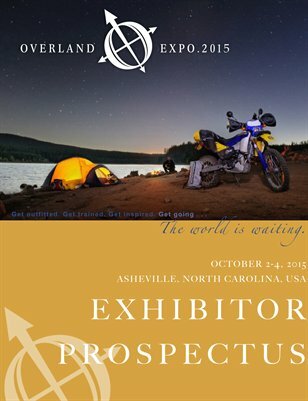 Overland Expo is an international event that inspires people to get out and explore the world. Over 6000 do-it-yourself adventurers enjoy 85 different classes, workshops, and roundtable programs, or visit 180+ exhibitors who offer four-wheel-drive and adventure motorcycles, accessories, camping gear, and adventure travel services. Overland Expo is organized by ConserVentures, an Arizona organization that promotes overlanding and exploration. The Overland Sourcebook: Your Guide to Adventure is the annual resource publication of Overland Expo, with listings of hundreds of overland vehicles, motorcycles, gear, services, & information. Order a print copy (at our cost, no markup) or download a PDF or iPad version FREE. For more information, visit www.OverlandExpo.com, or call Roseann Hanson at 520-591-1410. Print + Digital: $1.68 Digital: Free!